What's cleaning today at Able Carpet Care: Why is vacuuming important in your home or work with a HEPA filtration vacuum. Why is vacuuming important in your home or work with a HEPA filtration vacuum. The HEPA vacuum will trap the particulate matter you extract from the fibres and trap it in a filter. High-efficiency particulate arrestance (HEPA), also sometimes called high-efficiency particulate arresting or high-efficiency particulate air, is a type of air filter. Filters meeting the HEPA standard have many applications, including use in medical facilities, automobiles, aircraft and homes. The filter must satisfy certain standards of efficiency such as those set by the United States Department of Energy (DOE). To qualify as HEPA by US government standards, an air filter must remove (from the air that passes through) 99.97% of particles that have a size of 0.3 µm. Regularly vacuuming your home with a HEPA vacuum cleaner helps to prevent mold. The HEPA filters in HEPA vacuums trap very small particles like mold spores and other allergens. This also means the air in your home will be cleaner and you will suffer less from allergies or mold symptoms. It's best to vacuum your home at least once a week with a HEPA vacuum cleaner. HEPA vacuuming also helps if you are removing mold growth in your home. Once you've removed the mold you should vacuum your house with a HEPA vacuum to remove any mold spores that were stirred up. Non-HEPA vacuum cleaners don't help with mold problems. Mold spores are too small to be trapped by the filters in non-HEPA vacuums. Most mold spores simply end up passing through the vacuum, out the exhaust and into the air. This can even make things worse since mold spores that were on the floor get blown into the air. This is why many people's allergic reactions actually increase after vacuuming with non-HEPA vacuum cleaners. Make sure especially to never vacuum over mold growth with a non-HEPA vacuum. One exception where vacuuming with a non-HEPA portable vacuum cleaner can help is if the vacuum exhausts its air outside the home. Central vacuuming systems that exhaust the air outside also remove mold spores from the home. HEPA vacuum cleaners remove mold spores from the home and the less mold spores there are inside the less likely it is that mold will grow. Vacuuming at least once a week minimizes mold spores and greatly reduce the chances of mold starting to grow in your home. Vacuuming up mold spores with a HEPA vacuum prevents them from being stirred up into the air and triggering allergies. 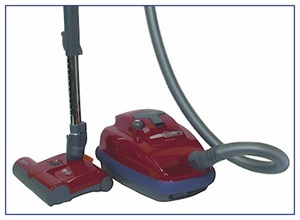 HEPA vacuums also remove household dust and other allergens which cause allergic reactions and can trigger asthma. The same HEPA filters in HEPA vacuums are even used in indoor air filter units to remove allergenic particles from the air and improve indoor air quality. For a description of the symptoms that mold causes visit the Mold Symptoms page. You will never be able to remove every single mold spore from carpet. However lab tests of carpet samples under the microscope show that HEPA vacuuming significantly reduces the amount of microscopic particles in carpet. Again, vacuuming at least once a week will improve your home's air. Even if you don't have mold, HEPA vacuuming still helps since it removes dust and other allergens. You can also use a carpet washer to remove even more allergens, mold spores, dirt and other particles from your carpet. Carpet washers can be hired from places like supermarkets. If you still find your allergies are sensitive you can remove the carpet in your home altogether. Having hard floors in the home instead of carpet is much better for people who suffer allergies. HEPA vacuuming is an important part of mold removal and remediation. Mold removal professionals use powerful HEPA vacuums when they are removing mold. 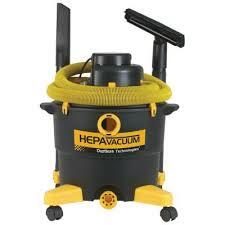 If you have to remove mold in your home yourself you should also use a HEPA vacuum. It's a good idea to start the mold removal process by HEPA vacuuming the room. This will remove the mold spores in the surrounding area. Once you've cleaned away the mold with a mold killing product such as vinegar, bleach or borax, you should then HEPA vacuum again once the surface is completely dry. HEPA vacuuming the surface and all surrounding surfaces will remove any mold spores which were stirred up during the mold removal process. This is part of the final clean up stage of mold removal. Besides the floor, even walls, ceiling, shelves and other surfaces should be vacuumed if possible. Also vacuum any furniture that was around the mold. The brush attachment for your HEPA vacuum helps when vacuuming furniture and other items. This is a great "dog and cat" vacuum. I use this in my home. Able Carpet Care (Able CC Fiber Care) Strives to be the best cleaners, we are members of both SCRIA (Specialised Cleaning & Restoration Industry Association) and IICRC (Institute of Inspection Cleaning and Restoration Certification. We are accredited by Wools of New Zealand and we are also Woolcare technicians. This means you can be confident we can solve your cleaning problems efficiently and on time. Able Carpet Care prides itself on being a family business specialising in the restoration of fibres. Such as lounge suites, curtains, rugs and carpets.